This is definitely the perfect screenshot for today, as Canadians recover from the weekend's fiery festivities and people in the US celebrate Independence Day by going online and ordering the ingredients for explosives. In this screenshot, you can take joy in the friendly way Amazon informs us that people who buy one ingredient for thermite often buy all of them together (thermite contains aluminum powder and iron oxide powder, and is usually lit with magnesium ribbon). Now these are the kinds of product recommendations we need. What could go wrong? Over at the fine site "How to Make Stuff," we learn the hard way to make thermite by scrounging the ingredients at local machine shops and paint stores. But why dig around and deal with finding stores in the real world when Amazon makes it so easy for you? 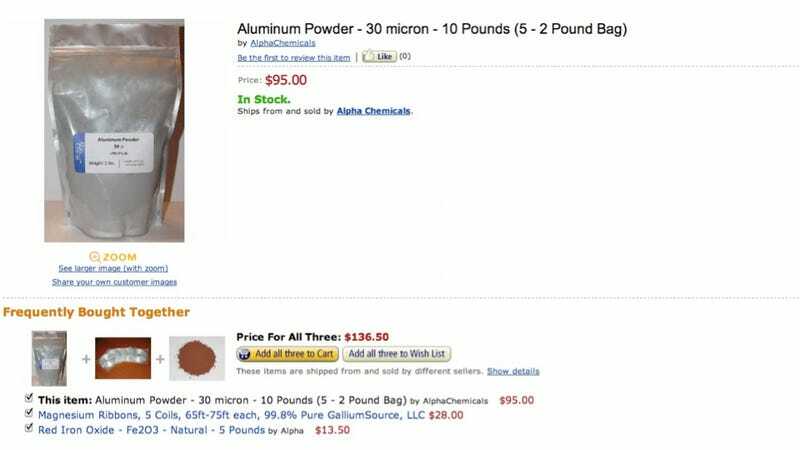 To see this for yourself, just search Amazon for aluminum powder. Also, PLEASE DO NOT MAKE THERMITE AT HOME.